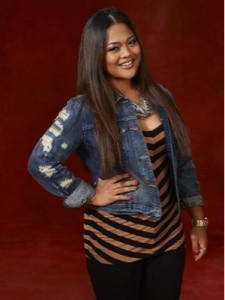 Filipino-American contestant Cheesa of the Voice was eliminated on the April 24th episode of the show when she went head-to-head with team mate Juliet Simms. “But Juliet, your voice is like art imitating life, and life isn’t perfect. And we all live in that life. And this is why America, their energy is invested in Juliet and I cannot argue with America and the support that they have given Juliet. So as tough as this is, I have to go with Juliet." Cheesa performed her rendition of Kelly Clarkson's "Already Gone." On Twitter, she posted this message, "FOREVER BONDED IN RED!!! Thank you @CeeLoGreen for everything! #redzone slay finals @JSquidward @JulietSimmsALL !!! Rep the crew!"